Istanbul, July 19 (Just News): Turkey’s state of emergency which was imposed after the failed 2016 coup came to an end on Thursday, but the opposition fears it will be replaced by even more repressive legislative measures. The biggest purge of Turkey’s modern history has targeted not just alleged supporters of Fethullah Gulen, the US-based preacher blamed for the coup, but also Kurdish activists and leftists. The former leaders of the opposition pro-Kurdish Peoples’ Democratic Party (HDP) -- Figen Yuksekdag and Selahattin Demirtas-are still languishing in jail following their arrest in November 2016 on charges of links to Kurdish militants. 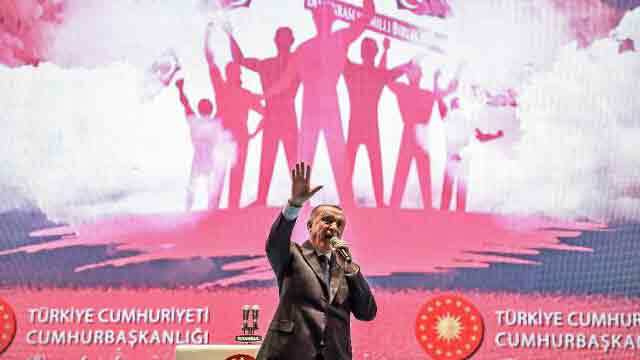 During last month’s presidential election campaign, which he won, Erdogan pledged that the state of emergency would end. But the opposition has been angered by the government’s submission of new legislation to parliament that apparently seeks to formalise some of the harshest aspects of the emergency. The bill, dubbed “anti-terror” legislation by pro-government media, will be discussed at commission level on Thursday and then in plenary session on Monday. The main opposition Republican People’s Party (CHP) said the new measures would amount to a state of emergency on their own. “With this bill, with the measures in this text, the state of emergency will not be extended for three months, but for three years,” said the head of the CHP’s parliamentary faction, Ozgur Ozel. “They make it look like they are lifting the emergency but in fact they are continuing it,” he added. Under the proposed legislation, the authorities will retain for three more years the power to sack civil servants deemed linked to “terror” groups, retaining a key power of the state of emergency. Protests and gatherings will be banned in open public areas after sunset, although they can be authorised until midnight if they do not disturb the public order. Local authorities will be able to prohibit individuals from entering or leaving a defined area for 15 days on security grounds. And a suspect can be held without charge for 48 hours or up to four days in the case of multiple offences. This period can be extended up to twice if there is difficulty in collecting evidence or if the case is deemed to be particularly voluminous. Fotis Filippou, Amnesty International’s deputy Europe director, said many of the powers of the state of emergency will remain in force. “It (the lifting) needs to be accompanied by urgent measures if it is to be anything more than a cosmetic exercise,” said Filippou. Some commentators suggested that the end of the state of emergency could signal the release of US pastor Andrew Brunson, who has been held in a Turkish jail for almost two years on terror charges, in a case that raised tensions with Washington. But at Brunson’s latest hearing on Wednesday, the court ordered that he should stay in jail. The authorities have also shown no hesitation in using the special powers of the emergency-right up to its final days. Following a decree issued on July 8, 18,632 people were sacked -- 8,998 of them police officers-over suspected links to terror organisations and groups that “act against national security”. The move came just two weeks after Erdogan was reelected under a new system that gives him greater powers than any Turkish leader since the aftermath of World War II. The new executive presidency means government ministries and public institutions are now centralised under the direct control of the presidency. Erdogan says it is necessary to have a more efficient government, but the opposition claims it has placed Turkey squarely under one-man rule.